Steven Covey’s Seven Habits of Highly Effective People essays delve into Covey's book on how to approach achievement and personal change, and applying these changes to everyday life. 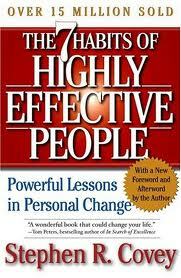 This is a brief training on The Seven Habits of Highly Effective People by Steven Covey. For college students who need book reviews, a good review will include examples of the books usefulness in the business world. One of the foremost experts in the field of leadership training is Dr. Stephen R. Covey, the author of The Seven Habits of Highly Effective People. Covey advocates principle based leadership training that seeks to build character. Have the writers at Paper Mastsers write a book report on The Seven Habits of Highly Effective People: Restoring the character ethic. The principles that Covey believes that companies need to concentrate on in order to develop leaders include empowerment, trust, trustworthiness, integrity, and personal growth. Leaders need to create cultures in their companies that recognize these basic principles. In Covey's model, leadership is broken down into three basic functions. First, there is pathfinding. In this role, a leader develops and articulates a vision for the future and gets people excited about it. The second activity is aligning. This means that the leader ensures that a company's organization, systems, and processes are consistent with, and contribute to, the leader's vision and the company's mission. The third activity is empowering. This means that the leader gives the people in the organization the power and resources to accomplish their portion of the organization's mission. This will unleash hidden talents, energy, and creativity. Covey trains leaders for companies in a variety of ways. These include books, on-site workshops, seminars, and training events at his institute for leadership in Utah. Covey also encourages follow-up training and assessment. Many companies have credited Covey and his training for helping them to develop leaders for the future. Paper Masters writes custom research papers on Steven Covey’s Seven Habits of Highly Effective People and delve into Covey's book on how to approach achievement and personal change, and applying these changes to everyday life.